Business students in all the top MBA programs experience what’s called the herd mentality during recruiting season. And although many fantasize about risking it all to become the next great entrepreneur, in the end most still head to corporate America for a safer job and a guaranteed pay check. But every now and then there are exceptions. Mavericks that lead with energy and idealism. Leaders optimistic that with passion and hard work, they can build their own empires. And I have the great pleasure of knowing one of them. 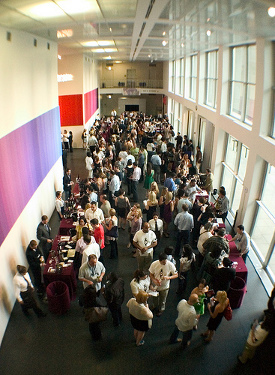 And just this past Friday, I spent the evening at Chicago’s Museum of Contemporary of Art (MCA) with leading entrepreneur Alyssa Rapp at an event put on by her internet start-up company Bottlenotes. Meeting up with Alyssa at the Chicago MCA wasn’t by happenstance. In fact, I first met Alyssa in 2006, when I lived in Palo Alto after graduating from Stanford. As a fresh, young graduate looking for new and exciting opportunities, I had the dual goal of not only working full-time at a start-up consulting firm but also rolling up my sleeves at a real start-up. So I sent a few emails and made a few calls, and I eventually found myself working with Alyssa in the evenings and on weekends, when I wasn’t in the office. And not only did I gain have exciting and interesting experiences working at a internet start-up, but being the Anthropologist I am, I also paid attention to the things Alyssa did and tried uncovering the skills it takes to be an entrepreneurial CEO. And after doing similar research on other entrepreneurs over the years, I’ve found that to be truly great, entrepreneurs usually have a unique combination of skills – passion and creativity, an ability to take risks, the capacity to make decisions quickly, and also an ability to balance competing priorities, especially in the early stages. These are all traits that aren’t necessarily typical for JDs or MBAs. In law school, JDs are taught to identify risks and mitigate them. They’re also taught to analyze issues from both sides before making decisions and to focus intensely rather than juggle multiple tasks. On the other hand, MBAs are taught to be a bit more decisive. But because in business school quantitative skills are king, MBAs tend to rely on supporting data rather than creative thinking or intuition. Harvard Business School likes to say that it trains students to get in the habit of making decisions. But in my view, being an entrepreneur is a bit more nuanced than both of those. Not only must they perform analysis and assess risks but they also have to do it real time, so they are better positioned to identify and seize opportunities immediately when the market changes. That also means they have to be fearless and quick to act, not always out of “habit” but often times using intuition or gut feel. So entrepreneurs tend to have a higher tolerance for uncertainty and an uncanny ability to focus on the details while always honing in on the bigger picture. A herculean set of tasks by all measures. And it looks like a lot of these traits have paid off for Alyssa. And last night the good people of Chicago got a glimpse as the MCA was jam-packed withwell over 800 people, a number which would have been significantly higher if the event hadn’t sold out due to the MCA’s capacity. It was great to see Alyssa again and to see how successful her company is becoming. It was also great to see a Kellogg alum and Bottlenotes COO who I’ve gotten to know over the past few months, not to mention meeting dozens of new people at the event. I even ran into a good friend of mine from undergrad and into a Northwestern JD-MBA from the class of 2008. In the end, I’m glad Alyssa was bold and decided to be an exception after graduating from Stanford Business School. And as a result, today she’s building a business that provides a unique product, delivers a highly customized service, and perhaps most importantly that brings thousands of people together from across the US to share enriching and memorable experiences. Bravo Alyssa and bravo Bottlenotes! I hope that all my readers take a second to check out her company. Click here to learn more about Bottlenotes. And if you’re up for a bit more reading, click here for an online interview by Start-up Stories, and here for a podcast interview on iinovate.com. JEREMYCWILSON.COM » What Would You Do if You Weren’t Afraid? Sheryl Sandberg and Facebook.